That is NOT my natural skin tone. 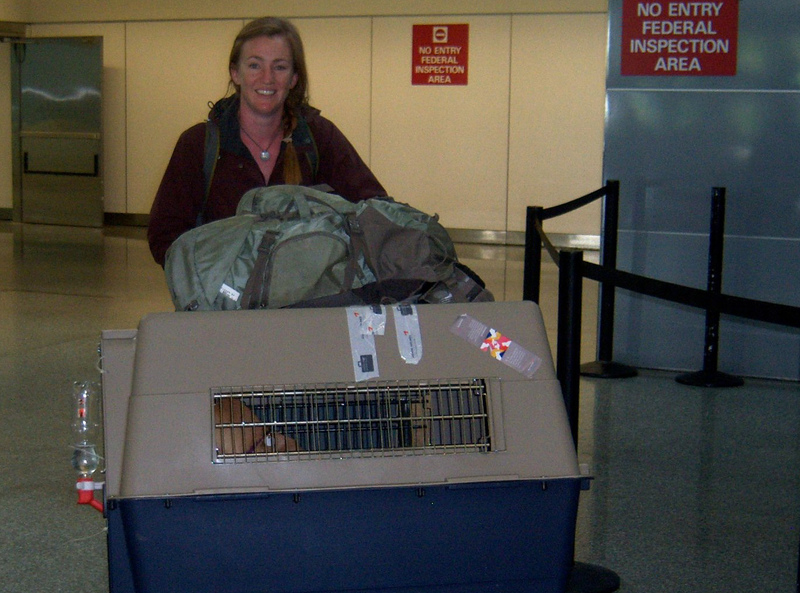 The moment had finally arrived—after 22 hours in transit, I approached the “Live Animals” baggage office at SFO to claim my Thai dog, Lady. I had worried about her constantly throughout the flight from Phuket to Seoul, 5-hour layover, and final 10-hour haul to California. As I turned the handle, an airline worker backed out of the door, pulling the crate behind him. There she was: alive and excited to see me with a crate covered in poop. Hey, two out of three positives ain’t bad. We had done it… exhale! A quick check-in with US Customs was all that stood between us and freedom. Me: “Hi.” Hand over Customs card with “Live Animals/Animal Products” box checked. Me: RUN before he thinks to check her poop for illegal drugs. On the other side of Customs stood my mom, camera in hand, ready to capture the glorious moment of our homecoming. I eeked out a smile and hugged her tight. I had begun to feel ill just before departing from Thailand and 24-hours later I had full-blown body aches and chills, an unbearable fever, and a rash across my stomach and back. Two LAW folks had come down with Dengue Fever in the days before I departed and there was no denying that I had it, plain and simple. How I had contracted it given that I had no visible bug bites is beyond me. Pure luck, I suppose. Lady, for her part, was unfazed by the experience and patiently waited next to the van as we cleaned her cage of feces and ticks. Yes, ticks. Despite nearly two weeks of tick-removal efforts, special baths, and a dose of Revolution, the little jerks continued to come out of the woodwork. It could not stand. And so our first stop was Pet Extreme, where we scrubbed her down and applied Frontline, which we were told would eliminate ticks within five days. In the meantime, she’d be quarantined to the side of the house, as we couldn’t risk her spreading the parasites to Mom’s four dogs. Sorry Lady Pants. To top everything off, the next morning I noticed two open sores on Lady’s neck, most likely due to injection site infections that abscessed and ruptured. Of course, they didn’t open up while she had 24-hour veterinary care available, but they waited for her glorious homecoming. The poor thing had gone from Koh Lanta sweetheart to California mess in just two days. Thankfully she was already on an antibiotic regiment for the parasitic blood infection, so all that could be done was wait. A week later Lady and I are finally emerging from our time as social pariahs. She is tick-free and her abscesses are markedly improved. My fever is gone and the full-body rash is barely noticeable (at least that’s what I tell myself). Give us one more week and we’ll be the belles of San Francisco, I tell ya. Or rather, we’ll at least be able to go on a walk without having to alarm the CDC. There’s no place like home, right Dorothy and Toto? Right. Yay! So glad you both made it and that you are both on the mend. Big hugs!